Well, not quite. Because corporate and property records in many countries are now available online, it’s become so much easier for journalists to trace business dealings linked to crime or corruption across borders. The previous post explained how, in February, Hong Kong reporters were able to find evidence of some of the Bo family’s business dealings in both China and Hong Kong. Since then, major U.S. publications have followed the family’s trail in the U.S., the United Kingdom and Caribbean offshore havens.They mined information from corporate registries, stock exchange filings as well as property records databases. They also pierced though the multiple names and aliases used by various family members. Following on Hong Kong-based Next Magazine’s reporting, Bloomberg did a deep dive into corporate filings. In an April 13 story, it reported that two of Gu Kailai’s sisters are directors of several companies in Hong Kong and China. One sister, Gu Wangjiang, is director of Hong Kong-registered Hitoro Holdings, which owns a third – about $114 million worth of shares – of a Shenzen-listed company of which she is chairman. Bloomberg went farther, and found that the paper trail led to offshore havens. 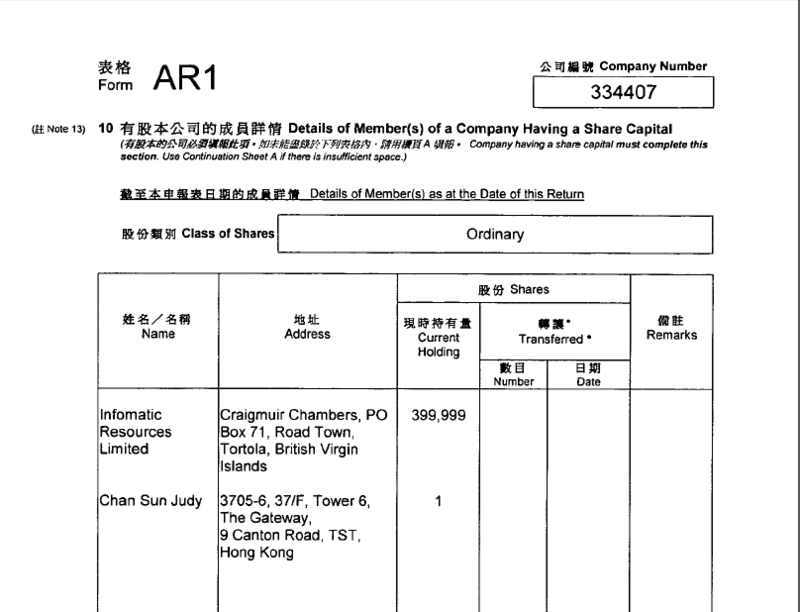 Hitoro’s controlling shareholder is Infomatic Resources Ltd., registered in the British Virgin Islands, according to Hong Kong corporate filings (a page from the company’s annual return is in the photo above. The document was downloaded from ICRIS, the Hong Kong corporate registry; the full annual return is here.). In addition, Gu Wangjiang, known in Hong Kong as Kuk Mong Kong, was also a director of the Panama-registered Sitoro Shipping Enterprises Co. and of a venture with Malaysian billionaire Vincent Tan’s Berjaya Group Bhd, said Bloomberg, citing Hong Kong corporate records. Earlier, the Wall Street Journal had found that Gu Kailai herself had also registered a company in the U.K. – but under a different name. The U.K.’s Companies House makes it relatively easy to find information on both public and private companies, unlike in the U.S., where information on private companies is scant. One can type in a company name in the Companies House website and download PDFs of the company’s filings for ₤1 each. Companies House only allows searches by company name or registration number,but the website duedil.com enables searches by director name. But there was no director listing for Gu Kailai. That’s because, according to the Journal, she registered a company under an assumed name, Horus Kai, which she also used when she was lawyering for Chinese companies in the U.S. in the 1990s. A search of Horus Kai yielded a company named Adad Ltd. The Companies House online database contains a PDF of Adad’s Form 363, the annual return U.K. companies are required to file. That form includes director’s names, dates of birth and occupation. Excerpt from Adad Ltd’s Form 363 that shows the name of Horus Kai, her address, date of birth, nationality and occupation. 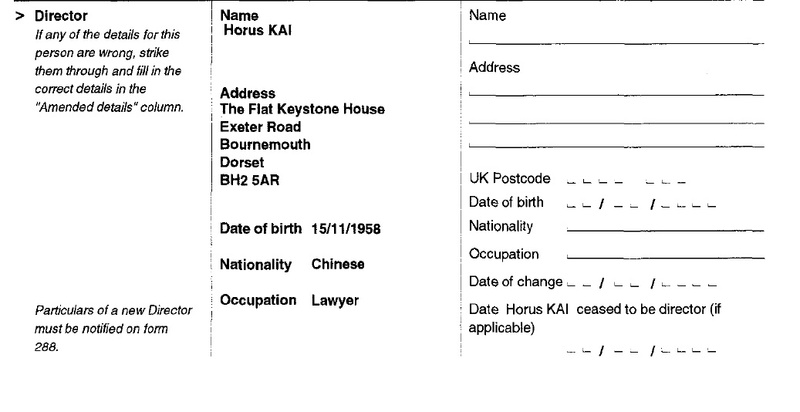 British public records show that in 2000 a Chinese lawyer using the name Horus Kai became a director of a company called Adad Ltd., based in the southern seaside town of Poole. Adad was dissolved in 2003. One public document has a signature for Horus Kai in Chinese, which is barely legible, but appears to include the final two characters of Ms. Gu’s real name, Kailai. That document gives a date of birth of Nov. 15, 1958—the same as that given for Ms. Gu on the Beijing justice department website—and a residential address in the nearby city of Bournemouth. Gu Kailai was close to a British businessman who died mysteriously.The business cards she distributed carried the name Horus L. Kai—a name she used in various business dealings over the years in the U.S. and U.K. A practicing lawyer in China, she helped chart the winning legal strategy, Mr. Byrne says. When the case was over, she invited her legal team back to China to entertain them in the port city of Dalian along with her husband, who was mayor there.